Where are the plans you intercepted? 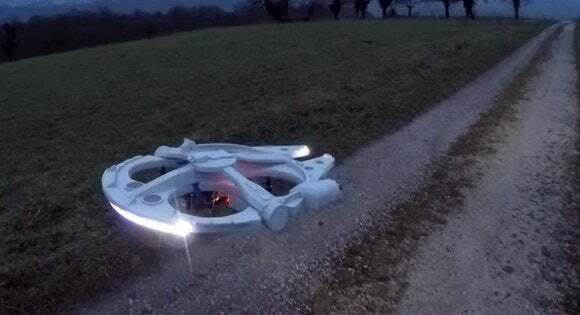 One crafty drone maker has lovingly crafted a quadracopter into the fastest hunk of junk in the galaxy, and he's smuggled the plans out so you can build her yourself. Built by a French hobbyist known only as Olivier-FR (we suspect he’s actually Corellian), the Falcon is described as an “overpowered little beast” on the reddit group discussing the pirate ship. The ship starts off as a Prophecy 335 quadrocopter, but yes, Olivier made a few special modifications. The ship itself is made from woven carbon fiber, aluiminum and instead of the YT-1300’s original Girodyne SRB42 sublight engines, Han, we mean Olivier-FR used two Tiger Motor MT2208-18 1100kV engines. The ship looks amazingly close to the YT-1300 light freighter, but you’ll notice the large cutouts for air and to smuggle illegal pharmaceuticals. Sure, we know, you’re asking how can a hero of the Alliance actually be a Spice smuggler? Well, if you can get away with gunning down a legally bonded bounty hunter in pursuit of his duties, you can pretty much get away with anything. It helps to be married to a high-ranking Alliance government official though. The Falcon has made two flights. The second flight, though, was cut short by an Imperial Star Destroyer. Olivier-FR claims the ship has made the Kessel Run in less than 12 parsecs, but we don't actually believe that either.